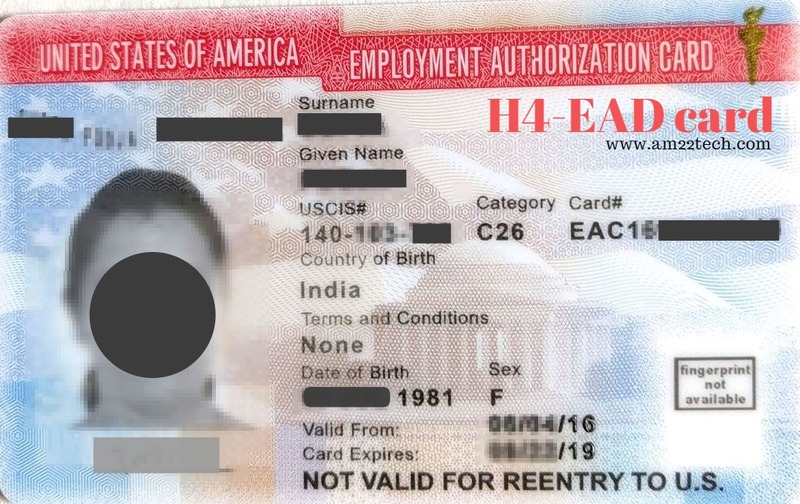 H4 EAD is an H4 Employment Authorization Document (EAD) that allows H4 visa holders to work legally in H4 EAD jobs without any employer or location restriction in USA. H4-EAD FEES check – A check (Personal or cashier) or money order for $410 payable to ‘U.S. Department of Homeland Security‘. Short forms like USCIS not allowed. Credit card payment is also accepted. PHOTO – 2 Identical photographs (2×2 Inch) clicked within last 30 days. Write your NAME and i94 number (OR SSN OR Alien registration number) on the back of the photograph with a light gray colored pencil. Form G1145 (Optional) – If you want USCIS to send you an SMS or an email once they receive your application, use this form and attach at top of the application package. Related: DHS is working on H-4 EAD termination rules. Form I-765, Application for Employment Authorization. Sample I-765 form for H4-EAD is given below. Most recent i-94 copy. If extension approved recently, the NEW i94 would be attached with your H4 extension approval (i797). Any other national identity document with photo. US State ID or Driving License is NOT acceptable. Relationship to the H-1B nonimmigrant – Copy of the marriage certificate issued in your country in English. H4 EAD eligibility proof – Primary H1B spouse’s I-140 i797c approval notice. If your employer has not shared I-140 approval copy with you, use USCIS FOIA request to get I-140 details. Q 29 on Form I-765 for H4-EAD? Which receipt number should I write? I have two receipts, one is H1B approval and other is i-140 Approval? Use H1B primary person’s most recent I-797 receipt number. This is NOT the I-140 approval receipt number. The document list is the same for H4 EAD renewal or extension as for new H4-EAD application mentioned above. USCIS does not allow you to apply earlier than 180 calendar days including weekend and holidays. Note that 180 Automatic EAD extension is not available for H4 EAD. It is possible that the START date for this extension is in future. If your H4 expires in Sep, and you applied for renewal in Mar, same year, it is possible that your extended H4’s start date is Sep instead of March. It is on USCIS to give a current start date or future one (that correlates with your current H4’s expiry date). For the sake of filling up the i-765 form, we would consider the most recent H4 approval irrespective of its start date. Based on it, your i94 number and primary H1B i797 approval receipt number will be decided while filing i765. Q 21a: Form i-94 number: Use i94 number on the most recent H4 approval (i797 form). Use this START date even if it is in the future without any issue. 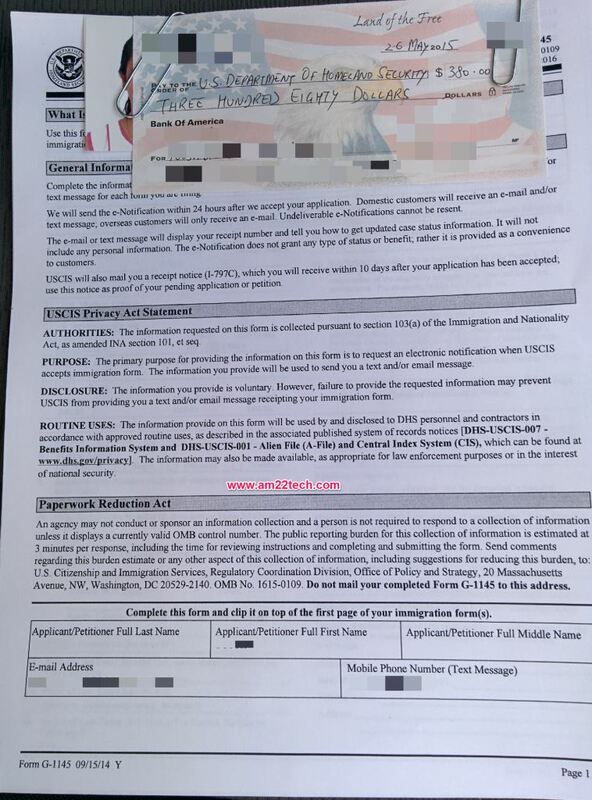 Check the USCIS address to mail H4 EAD application using H1B’s receipt number. Q 1: Reason for Applying? Applying H4 EAD for the first time, Choose 1.a. If you had any kind of EAD before (like L2-EAD), then you can consider H4 EAD as new EAD. For H4-EAD renewal applications, select 1.c. – renewal. Q 23: Place of Last Arrival into the US? Enter the name of the Airport (Port of entry like Newark International Airport) in the US on your most recent entry. For some people, this airport might be a non-US airport like Abu Dhabi where they complete the US immigration process at Abu-Dhabi airport itself. I would suggest writing either the “Port of Entry/Exit” as “MAA – ABU DHABI INTL” or the name of the US airport where you landed first. For example, if you landed in Washington Airport after completing the immigration process at Abu Dhabi airport, your i94 record will show the “MAA – ABU DHABI INTL” as the port of entry. You can then either write “Washington Airport” or “MAA – ABU DHABI INTL”. Q 28: Spouse eligibility degree on Form I-765? For H4-EAD applications, you can write ‘N/A’ or leave blank. Which color pen for signature on Form I-765? Only BLACK color ink pen is allowed as USCIS uses computer scanning to read forms. H4 EAD Processing times with USCIS are expected to be at least 90 days from the date of the H-4 EAD application’s receipt, provided that the applicant is already in H-4 status. They used to have an SLA (service line agreement) of 90 days earlier. It stands canceled and now there is no official time frame. SSN questions mandatory in new i-765 form? If you do not currently have SSN (which most first-time EAD filers will not have), just select ‘No’ on Q 13.a. and then select ‘Yes’ on Q 14 and Q 15. You will have to fill Q 16.a., 16.b. with your (H4’s) father and mother name to get SSN card. Your SSN card will be automatically generated after your EAD is approved within 3-4 weeks mailed by USPS. Should we staple all the documents together in application package? Do NOT staple the documents. Instead, use a paper clip to bind them together. Here is a sample of final documents package. Travel outside USA while H4 EAD under process? You can travel while H4 EAD is pending but with some restrictions. I am working on the I-765 to renew my spouse’s H4 EAD. My current H1 and my spouse’s H4 is valid until Sep’ 2019. The 765 form will be submitted along with I-129 (H1 renewal) and I-539 (H4 renewal). On I-765 section 29, it asks for the recent I-797#. As I am submitting this along with my 129 application, the most recent 797A is from 2016, which was used in obtaining the initial H4 EAD. Should I re-enter the 797A from 2016 here, or should I leave this blank, because I do not have a 797A (for 2019-2022) at this time. You can write “concurrent” in q29 on form I765 for H3 EAD. I got h4Ead receipt from california center.How many months will take time? Current California EAD processing time here. Hi Anil, my question is about field 17.a and 17.b in i-765. It is asking for Mother’s birth name, if last name is different from what is printed on my India password is fine? Or do I have to provide any supporting document about mother’s last name change after marriage? You should write your mother’s name as it appears on her passport as today. Do not worry about your mother’s maiden name.